Latent space interpolation of various vector drawings produced by sketch-rnn. This is an updated version of my article, cross-posted on the Google Research Blog. Instructions on using the sketch-rnn model is available at Google Brain Magenta Project. Link to our paper, “A Neural Representation of Sketch Drawings”. This article has also been translated to Simplified Chinese. Vector drawings produced by our model. Recently, there have been major advancements in generative modelling of images using neural networks as a generative tool. While there is a already a large body of existing work on generative modelling of images using neural networks, most of the work thus far has been targeted towards modelling low resolution, pixel images. Humans, however, do not understand the world as a grid of pixels, but rather develop abstract concepts to represent what we see. From a young age, we develop the ability to communicate what we see by drawing on a piece of paper with a pencil. In this way we learn to express a sequential, vector representation of an image as a short sequence of strokes. In this work, we investigate an alternative to traditional pixel image modelling approaches, and propose a generative model for vector images. Children learn to draw Doraemon as a sequential set of strokes. Children develop the ability to depict objects, and arguably even emotions, with only a few pen strokes. They learn to draw their favourite anime characters, family, friends and familiar places. These simple drawings may not resemble reality as captured by a photograph, but they do tell us something about how people represent and reconstruct images of the world around them. — Harold Cohen, Reflections on Design and Building AARON. In our paper, “A Neural Representation of Sketch Drawings”, we present a generative recurrent neural network capable of producing sketches of common objects, with the goal of training a machine to draw and generalize abstract concepts in a manner similar to humans. We train our model on a dataset of hand-drawn sketches, each represented as a sequence of motor actions controlling a pen: which direction to move, when to lift the pen up, and when to stop drawing. In doing so, we created a model that potentially has many applications, from assisting the creative process of an artist, to helping teach students how to draw. In this work, we model a vector-based representation of images inspired by how people draw. We use recurrent neural networks as our generative model. Not only can our recurrent neural network generate individual vector drawings by constructing a sequence of strokes, like these previous experiments on Generative Handwriting and Generative Kanji, our model can also generate a vector drawing conditional on a latent vector, , as an input into the model. Similar to a previous work where we interpolate between multiple latent vectors to generate animated high-resolution morphing MNIST animations, we can train our model on hand-drawn sketches from the yoga category of the QuickDraw dataset, and have it dream up yoga positions in both time and space directions. Our model, sketch-rnn, is based on the sequence-to-sequence (seq2seq) autoencoder framework. It incorporates variational inference and utilizes Hyper Networks as recurrent neural network cells. The goal of a seq2seq autoencoder is to train a network to encode an input sequence into a vector of floating point numbers, called a latent vector, and from this latent vector reconstruct an output sequence using a decoder that replicates the input sequence as closely as possible. Reconstructions from a model trained on cat sketches sampled at varying temperature levels. It is important to emphasize that the reconstructed cat sketches are not copies of the input sketches, but are instead new sketches of cats with similar characteristics as the inputs. 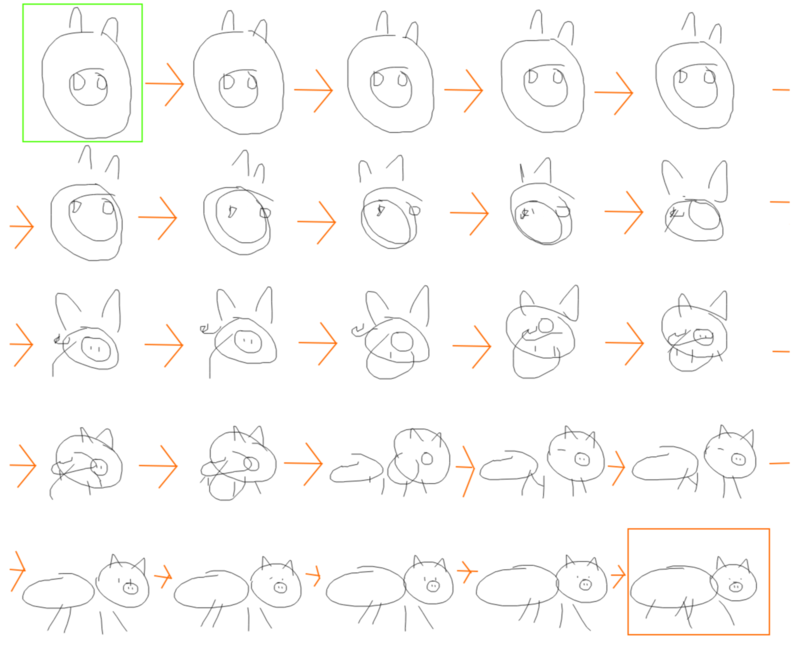 To demonstrate that the model is not simply copying from the input sequence, and that it actually learned something about the way people draw cats, we can try to feed in non-standard sketches into the encoder. When we feed in a sketch of a three-eyed cat, the model generates a similar looking cat that has two eyes instead, suggesting that our model has learned that cats usually only have two eyes. To show that our model is not simply choosing the closest normal-looking cat from a large collection of memorized cat-sketches, we can try to input something totally different, like a sketch of a toothbrush. We see that the network generates a cat-like figure with long whiskers that mimics the features and orientation of the toothbrush. This suggests that the network has learned to encode an input sketch into a set of abstract cat-concepts embedded into the latent vector, and is also able to reconstruct an entirely new sketch based on this latent vector. Reconstructions from a model trained on pig sketches sampled at varying temperature levels. These interpolation examples suggest that the latent vectors indeed encode conceptual features of a sketch. But can we use these features to augment other sketches without such features - for example, adding a body to a cat’s head? 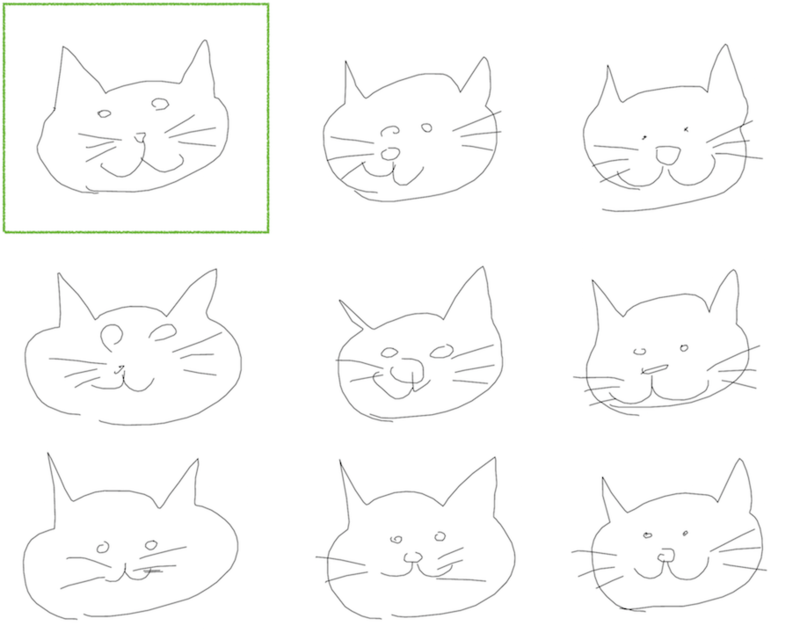 Similar, but unique cats, generated from a single input sketch in the greenbox (left). Exploring the latent space of generated chair-cats (right). For instance, in the earlier figure above, we feed sketches of four different chairs into our cat-drawing model to produce four chair-like cats. We can go further and incorporate the interpolation methodology described earlier to explore the latent space of chair-like cats, and produce a large grid of generated designs to select from. Exploring the latent space between cats and buses, elephants and pigs, and various owls. The model can start with incomplete sketches and automatically generate different completions.